Lately I have been a huge fan of Central Square Theatre. Last season’s Sila gave me goose bumps, and I can’t help but admire their unique yet incredibly efficient operating model. Combining a beautifully flexible space and strong leadership, Emilie: La Marquise Du Chatalet Defends Her Life Tonight (which I will henceforth simply refer to as Emilie) should have been a stellar, high octane production. Strong leadership stepped into the spotlight: Lee Mikeska Gardner, the Artistic Director of the Nora, takes a tour as the title character. Gardner’s task is not small in this biographical pseudo-retrospective, jumping in and out of narration, alternating between real time and soliloquy. Over the course of two hours, Gardner recounts how Emilie, an outspoken and revolutionary mind, dared to break boundaries and challenge the conventions of science, politics, and romance in a time when men were the only voices which counted and women were thought to be inherently inferior. I admire Gardner for her efforts and applaud her performance heartily, but as tall as that mountain was, I don’t feel as though she scaled it. Her performance was powerful, but not passionate; driven, but lacked dynamics; complicated, but not complex. She rattled through endless, sometimes oddly structured dialogue and theatrical devices at the same pitch and pace for the duration of the production, and monotonously pushed her way through exposition and character development without a moment’s dynamic pause. I struggled with her performance for two hours because she set the stakes at a constant high but cornered herself into being unable to raise them. Thankfully, the presence of a versatile ensemble brought both levity and depth to Lauren Gunderson’s script. Sophorl Ngin is once again a breath of fresh air for me (pun intended, if you read my review for Sila). Playing both young Emilie and, later, Emilie’s daughter, she and she alone finds a way to raise the stakes and, with Gardner, delivered once of the most truthful and powerful scenes in the show. 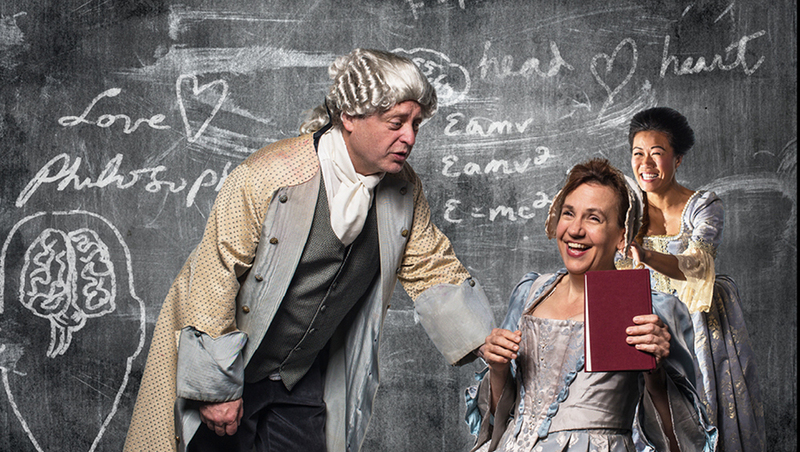 Steven Barkhimer as Voltaire, Emilie’s partner in both science and illegitimate love, is both funny and poignant, and Michelle Dowd as Madame is hilarious in her delivery of some of Gunderson’s lighter writing. Lewis D. Wheeler rounds out the cast playing a variety of roles, most of which are plot devices, and all of which he does a fine job at. My biggest gripe, however, is with the numerous accounts I have heard touting Gardner’s performance as “Tour De Force.” Perhaps these reviewers have seen something that I have not. I admit that Gardner was up against one hell of a challenge, but the task itself does not define quality of the performance. Only the execution of that task should warrant such an accolade, and while I openly applaud Gardner for her performance, I feel as though the term “Tour De Force” is being thrown around here almost as wildly and freely as the modern standing ovation. Just because you did something does not mean that you deserve to be praised for doing it. This isn’t a child’s tee-ball league; not everyone can get a trophy. Audra McDonald in Porgy and Bess was a Tour De Force. Jan Maxwell in Follies was a Tour De Force. Gardner as Emilie was a very good performance. Regardless, I left Central Square feeling quite glad that I had caught that performance. The Nora and The Underground Railway continue to produce solid work, both technically and artistically. I am eagerly looking forward to the rest of their season. Look for my review of A Disappearing Number later this month!